In case you haven't looked at a calendar lately, or been inside a store. Valentines Day is fast approaching. This is a holiday my cold bitter heart dreads every year. I can't remember any good Valentines Days. I'm sure there may have been one or two along the way. But the negatives have far out weighed the good. To make any single or lonely people feel better about their situation I will share some of my worst Valentines Days. I am not including days that I may have been single. These all occurred while in relationships with someone. I've heard "I don't celebrate Valentines Day, I'm sorry I didn't tell you that in advance before you got me something"
I've had someone ignore it completely until about 8 o'clock the date of and then say "Well I guess I should go out and buy you something" ummm no I guess you should have thought about that before the day was about over. I can't forget "Where do you want to go eat?" While you decide I am going to lay down and sleep the rest of the evening. Valentines Day came and went not a word....the very next day....Flowers delivered. Then there was the time I got a meme about how he didn't have to get me anything for Valentines Day because he already had me and didn't need to win me over. Wow, so romantic! "Well, I guess I should go buy you something now." That really sounds like it came from the heart. You know, I love going to the grocery store on Valentine's Day, especially around 5 pm, and just seeing the huge 20-person line of guys buying flowers last minute. Great thinking, guys! I like the day after when everything goes on sale. Its comical to me now that I consistently have terrible Valentines Days. I guess I should add last Valentines Day when my boyfriend asked me to move out. That was probably the best ever. I can't believe I left it off the list. Ha, wow. I think I remember #2 being mentioned before, so I have to think that one is recent, in which case, I know who that was. Blah. Luckily John wants to do stuff. I'm not huge on it, but he calls it a 'chick holiday that i have to do something for you for' so we just go to dinner and drink a lot of champagne. Oh dang, sorry about your poopy Valentines Days. We don't do a huge amount. All the restaurants are usually insane. 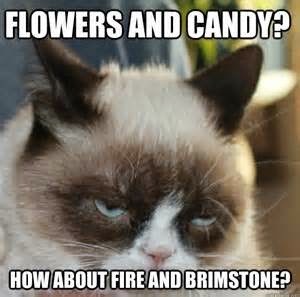 Valentine's Day is dumb. Chris and I talked about that the other day and I told him I have NO expectations because I think it's a dumb holiday. So we aren't doing anything special. But I DID get him a *little* something. Just a small trinket because it feels weird to completely ignore it. They are here too. I would be happy to have something home cooked and watch a movie on the couch. It doesn't have to be big or cost a lot. it really is the thought. I never really had any expectations either, I would like a little recognition though.